Charter school supporters argue that the greater flexibility afforded to the schools better enables them to develop new and innovative approaches to teaching. For the system to succeed, there must be a commitment to rigorous data analyses evaluating the performance of these schools. 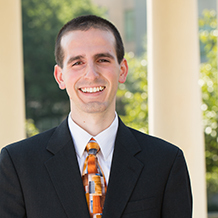 Analysts like Adam Bethke, MPA ‘15, lead within this field. He is currently serving as a data and policy analyst at the D.C. Public Charter School Board. When Adam was deciding where to pursue a graduate education, he had a tough decision. He could accept a Fulbright Scholarship to study in the UK, or continue his studies at his undergraduate alma mater and accept an offer from the Trachtenberg School. Adam chose to remain a Colonial. Adam also appreciates how the school combines rigorous academic training with an emphasis on career preparation. He points specifically to the array of professional development opportunities he pursued while in the program, from networking mixers, to expert panels, to on-site meetings with potential employers. He also highlights the extensive and highly-engaged alumni network Denise Riebman, the school’s Director of Career Services, has cultivated over the years. He remembers the job postings submitted by Trachtenberg alumni and is proud that he’s now in a position to post opportunities for his organization. “When we’re hiring, I know that the Trachtenberg School produces high quality applicants who have a passion for public service,” he said. Are you an aspiring data analyst? Adam might have a job for you.